On Sunday, Kevin and I had two deco dives. In between these, I accompanied Nathalie and Julie for a guided tour of several wrecks (crane, boat, bus) and the wall of the peninsula. 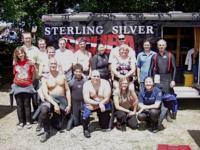 For the first deco dive, we started by accompanying AOW students on an deep adventure training dive. After the students were sent to the surface, we continued our dive in the whole at about 85-90 ft. We practice drills such as backup and primary regulator failure, air sharing (long hose) and stayed at the freezing bottom (40F) following cracks and looking around until we reached deco. We stayed for a little longer before ascending to 60 feet, swimming towards the south peninsula ramp. Once we reach our destination, we inflated our lift bag and started our deco stops. The first one was at 30ft (simulation) for 3 minutes and the second one at 15 feet for 5 minutes (We actually came out of deco on our 30ft stop, so we simulated at 15 feet instead of 10ft for the actual planned stop). Total dive time was 57 mins at max 90ft and avg 77ft. For our second deco dive, we started by touring the pump house. After 10-15 minutes, we navigated NW towards the peninsula until we reached the big boat at 60ft. Since we still had a lot of air and I was leading, I decided to go towards the crane, trolley and then go down at 90 ft until I would reach deco - we adjusted our plan... On our way back toward the platform we started our decompression procedure. I had 9 mins of deco at 10ft and Kevin had 10mins. Total dive time was 65 mins, 90ft. Once we got out of the water, the camp was all pack... We quickly packed our gears since our families were waiting for us... We exited Dutch at 6pm sharp, had a nice dinner and hit the road toward NoVA reaching home at 11pm. Overall, it was a great weekend. I was thrilled to complete two training deco dives. 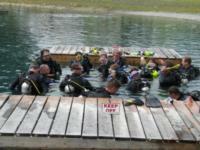 I did not have many opportunities to have such deep and long dives at the quarry... Nathalie also logged a few dives. It was the first time she dived without me as her buddy and dived dry all weekend.